A singer who’s also acclaimed for her songwriting will share her talents with Kansas audiences as The Ruth Moody Band, April 9 and 10 at Bethel College (North Newton) as the final event in the 2018-19 Hesston-Bethel Performing Arts (HBPA) series. The Ruth Moody Band concert is at 7:30 p.m., Tuesday, April 9, in Memorial Hall on the Bethel campus. Single tickets range from $18 to $27 (Bethel and Hesston College students receive free admission). Tickets are on sale at either Hesston or Bethel College bookstores on weekdays during regular business hours, or online. In addition to the concert, Moody and singer-songwriter Anthony da Costa will offer a song-writing and arranging workshop Wednesday, April 10 from 10:30 a.m. to noon in Memorial Hall. The workshop will include a short presentation by Moody and da Costa, a Q&A session, and an opportunity for several area singer/songwriters to perform their own songs for critique by the guest artists. Workshop seating is limited, and participants must RSVP to holly.swartzendruber@hesston.edu by April 1. To be selected to present a song for critique, include in the email an audio or video file or link. The HBPA performance is the only Kansas appearance for The Ruth Moody Band’s spring touring season. Moody was born in Australia and raised in Winnipeg, Manitoba, Canada. She is a founding member of the internationally-renowned, Billboard-charting trio The Wailin’ Jennys, as well as former lead singer of the Canadian roots band Scruj MacDuhk. Though best known for her work with the Jennys, Moody has been nominated for five Juno Awards (the Canadian equivalent of the Grammy®) and won two, in tribute to her “ethereal vocals,” multi-instrumentalism and songwriting talents. Moody released her first solo album, The Garden, in 2010, and the follow-up, These Wilder Things, in 2013. These Wilder Things includes guest appearances by Mark Knopfler, Jerry Douglas, Aoife O’Donovan, Mike McGoldrick, John McCusker and The Wailin’ Jennys. Moody has been recognized for her songwriting in U.S. and international competitions. Her song “One Voice” became the Jennys’ signature song and has been covered by artists around the world. “Storm Comin’,” Moody’s song recorded on the Jennys’ album Bright Morning Stars, won first place in the “Gospel” category at the International Songwriting Competition. 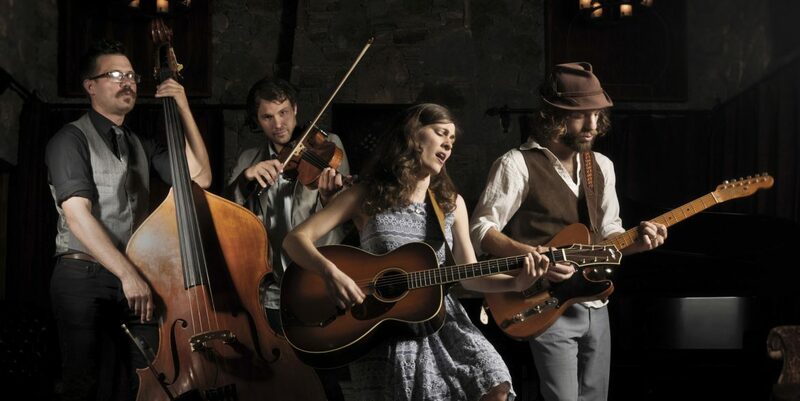 Other members of The Ruth Moody Band are Adrian Dolan, fiddle, mandolin, viola, mandola and vocals; Adam Dobres, guitar, ukulele and vocals; and Sam Howard, upright bass and vocals. The HBPA series started in 1982 as Hesston Performing Arts, then expanded in 1998 when Hesston College joined forces with Bethel College for Hesston-Bethel Performing Arts, to present five performances by world-renowned or regionally acclaimed artists each school year. HBPA is funded in part by the City of North Newton, Excel Industries and Hustler Turf Equipment (Hesston), the North Newton Community Foundation, the Kansas Creative Arts Industries Commission, which receives support from the National Endowment for the Arts, and media sponsor KMUW-FM 89.1 in Wichita, with additional funding from area businesses and patrons.